We all know what it's like to live in a small home, one way or another! With limited space, it can seem very difficult to decorate and keep organized. What if your small home was only 32 square metres? 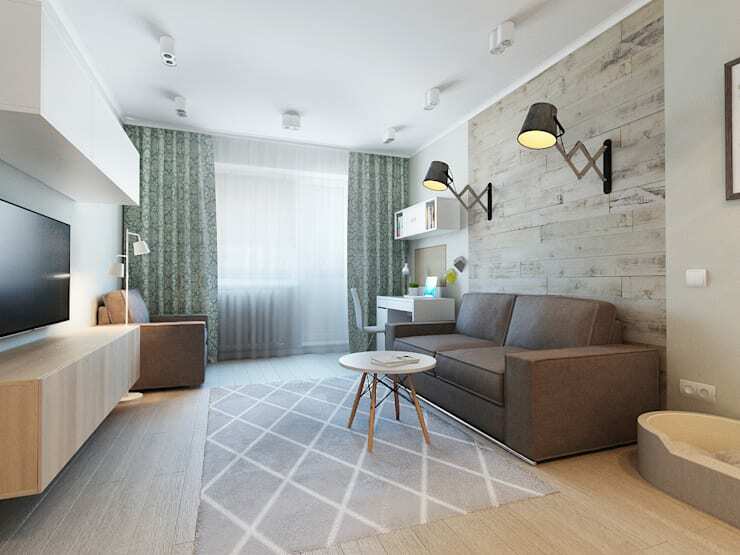 We can imagine how cramped and crowded a space like this might feel as well as how hard it would be to make such a little home look stylish and trendy. But that doesn't have to be the case ! 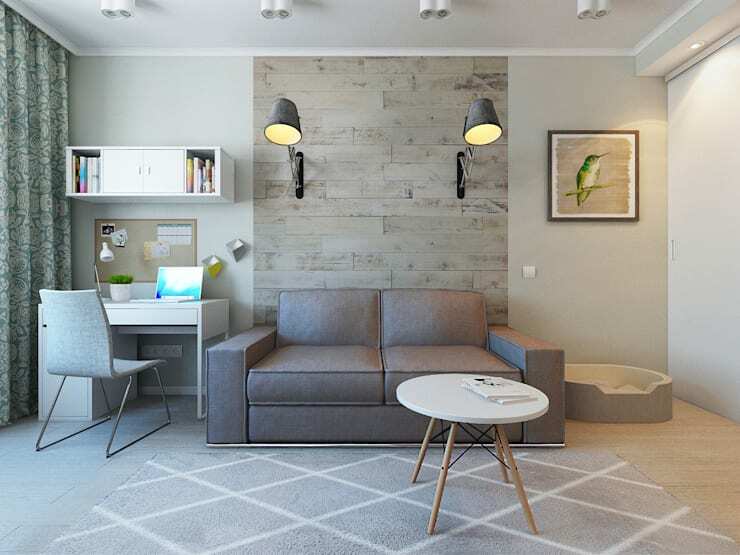 homify professionals Ekaterina Donde Design, have risen to the challenge of designing and decorating a small apartment, with extraordinary results. These interior designers have managed to create a space that is worthy of awards! If we step inside this home, we can see how they've maximized every nook and cranny. This little area doubles up as a living room, a home office and a sleeping area for the dog! The designers have separated these spaces very smartly, by utilizing the wall. You'll notice that there is a stone facade behind the sofa while the walls on the left and the right simply feature beige paint. Subtle and sophisticated! Lighting plays a huge role in this space as well! Don't you love the trendy lamps that are suspended above the sofa? This creates ambiance and a soft glow in the evening, which makes for a very cozy corner! In this image, we can see just how neatly squeezed into the corner the little home office is – a great design tip for any small home. In any other home, this little corner would have been wasted or used for a simple pot plant or decor item. Yet, the designers know what maximizing space for functionality is all about. You don't need a lot of space in order to fit your home office into a little nook like this one. Opt for very light materials such as a perspex chair and a thin, stylish desk. Then make the absolute most of the vertical space available to you. Install shelves on the wall above the desk, where you can store stationery, books and files. This will leave your office space looking neat and tidy throughout the day. A hallway doesn't just have to be a place that gets you from point A to point B in your home. In fact, if your home is small, it should become a showcase of interior design in itself. This is exactly what the designers have done here, using a beautiful lavender color for the walls throughout this space. Have you ever seen such a trendy hallway? The colorful walls complement the white finishes as well as the patterned flooring. 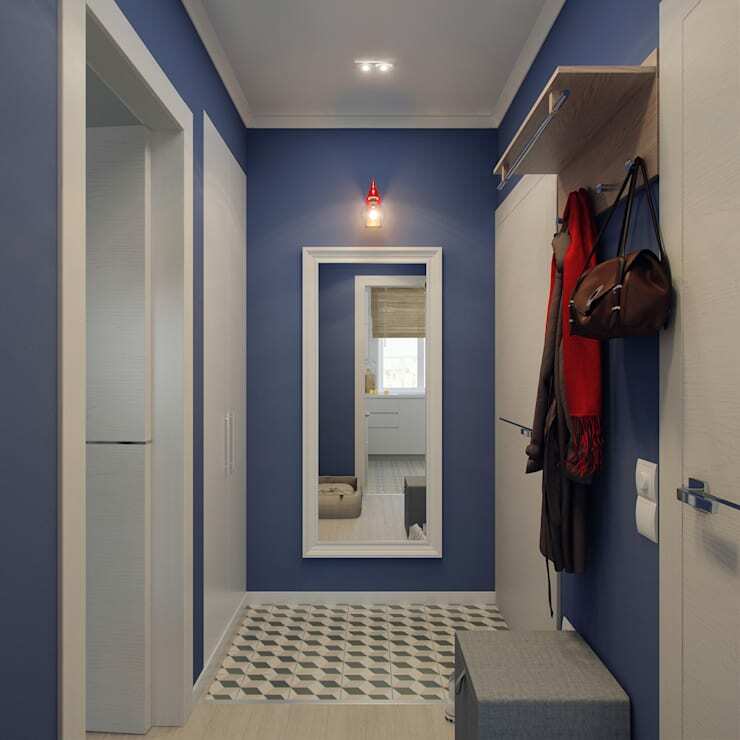 At the end of the hallway, you will see a large full-length mirror. Not only does it look beautiful and allow you to see your full outfit before you head out for the night, but it also visually expands the space, making it seem that much bigger – a great tip! You'll also notice that the walls have been utilized as storage space, thanks to hooks, shelves and a little cabinet. Remember that when it comes to a small home, every square inch counts! The kitchen is one of our favorite places in the home, because it's just so cheerful and welcoming. The designers have gone for white walls, cabinets and counter tops, which are enhanced by the beautiful and colorful patterned floor. 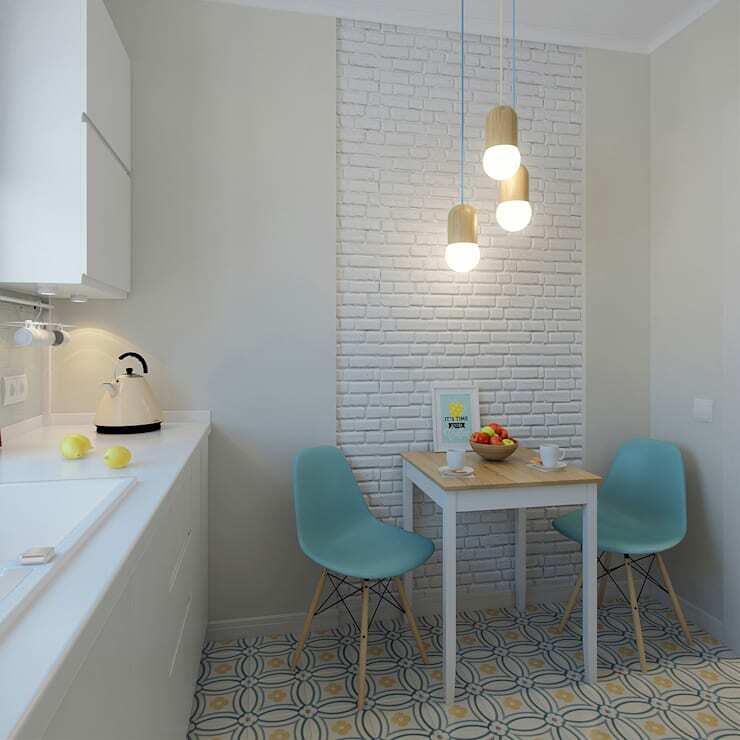 The yellows and blues in the floor pattern are further emphasized by the blue furniture in this space. You'll notice that the kitchen takes on a very minimalist design, with only the absolute necessary appliances or elements on the kitchen counter tops. Everything else is stored neatly away. If you have a small kitchen, this is a must! A clean and organized kitchen equals a happy cook! If we look in the kitchen from this angle, we can see how the space subtly brings in different textures to the space in the form of the raw brick facade, which has been painted white. Just like we saw in the living room, the facade serves to highlight a different section of a space, without there being any walls or divisions. The separated space is a little table and chairs, which allow the residents of this home to enjoy a cup of coffee together or share a casual meal. 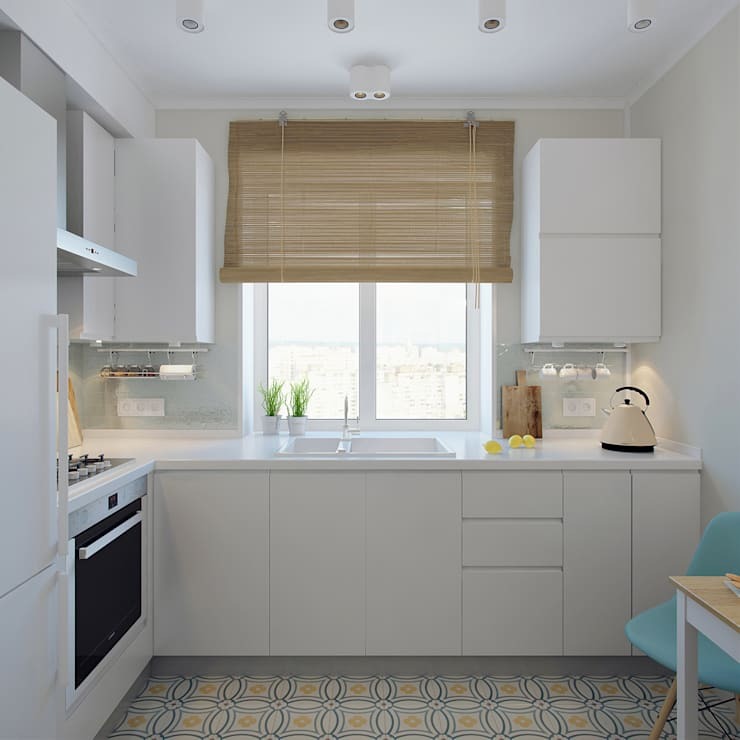 Because of how small and unobtrusive these furniture pieces are, they don't seem to take up too much space in the kitchen leaving plenty of room for cooking! The modern lighting is the cherry on top of this gorgeous kitchen design. The bathroom is also not very big, as we could have guessed. Yet the designers have been so smart about where they've placed each feature that it's certainly not cramped or crowded. The first obvious factor is that the designers have chosen to not include a bath, freeing up floor space. Unfortunately if you live in a small apartment, it makes sense to leave something like a bath out of the picture. The bathroom features very neutral colors including brown tiled floors, wooden furniture and white walls. There's also a touch of grey and purple in this space, which add a subtle yet sophisticated twist to the room. The shower is big enough, however, compensating for the lack of bath! 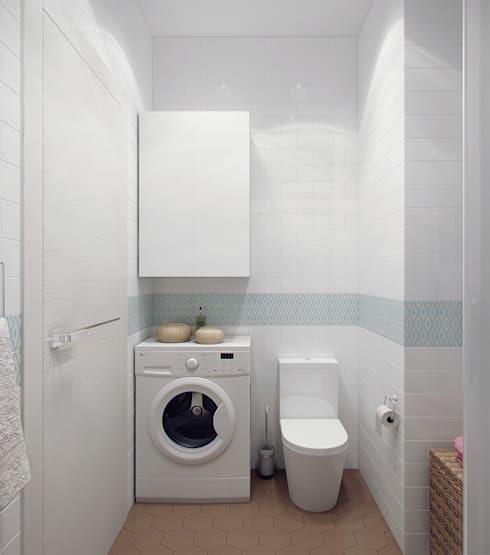 Unfortunately a bathroom may need to double up as a laundry in a small apartment, which is why there is a washing machine neatly fitted between the toilet and the wall. The washing machine is the same white color as the rest of the space, blending in very surreptitiously. There is a large cupboard above it where washing powder and fabric softener can be stored neatly away, out of sight. 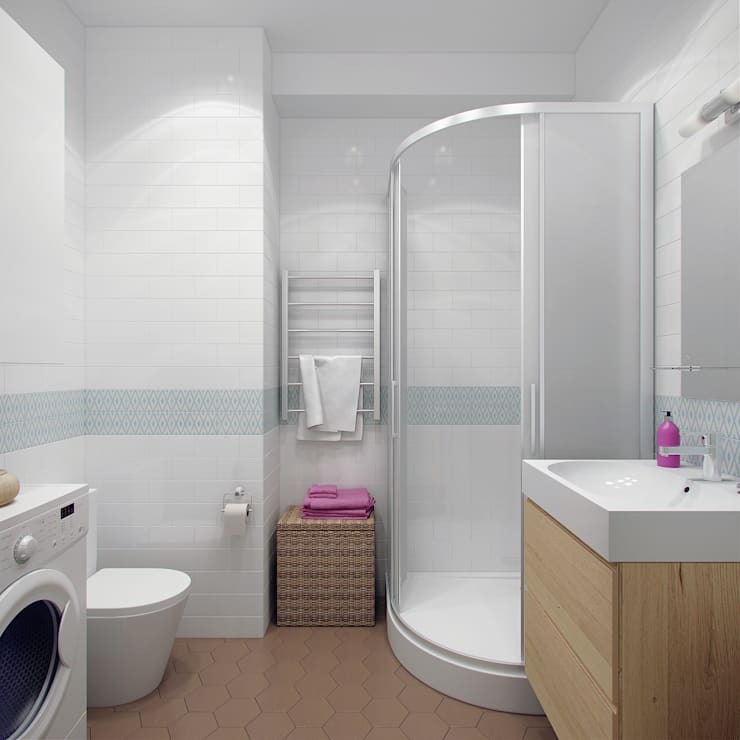 The bathroom is another example of how the designers have made the most of every nook and cranny in this home! Would you want to live in this little apartment? What design tips would you borrow from this project?